Xoconostle is a common feature of the Mexican landscape in semi-arid regions. Its mesocarp is processed into jellies, sauces and other products but the endocarp is discarded as waste. This endocarp contains appreciable amounts of bioactive compounds with antioxidant activity. 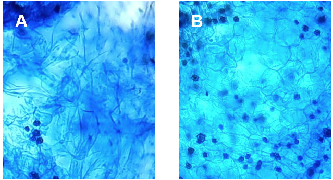 This study aimed to evaluate the effect of microwave pretreatment on phenolic compounds and flavonoid extraction from xoconostle endocarp and to determine their antioxidant capacity and microstructure changes. According to the surface response methodology, the optimal conditions for phenolic compounds and flavonoid extractions from endocarp using microwave pre-treatment (297 W for 5.5 min) were: 0% ethanol, 5 °C and 10 min of stirring. The total phenolic, total flavonoid, betalains and ascorbic acid contents, and the antioxidant capacity were higher in the microwave pretreated samples compared with non-pretreated microwave samples. The following phenolic acids and flavonoids were identified in the endocarp extracts obtained under optimal conditions: gallic, caffeic, protocatechuic, coumaric and, vanillic acids, epicatechin and catechin. Our results suggest that the application of a microwave pretreatment improves compounds extraction present in xoconostle endocarp, which could be an alternative source of bioactive substances with high antioxidant capacity.